Here is a quick reference guide on how to grow zucchini (or courgette). 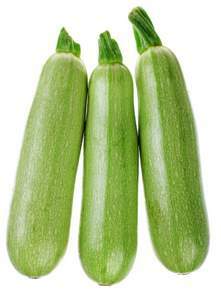 Zucchini is an annual vegetable which usually produces an abundant harvest. Zucchini is an attractive and spreading plant. Position: Prefers sunny position but tolerates semi-shade. Fertile soil. Sowing season: Early Spring to Summer. Zucchinis like warmth so sow indoors until late frosts have passed. Sowing method: Soak seeds overnight (even 2-3 hours will speed germination) and sow 1½-2cm deep. Sow seeds directly in beds or containers once soil is warmed by Spring. If sowing directly sow 3-4 seeds together and weed out weaker seedlings later. Spacing: 50-70 cm between plants, 60cm between rows. More compact varieties can be grown between taller companion plants like sweet corn. Watering: Mulch and keep well-watered, zucchini is greedy. Fertilising: Feed monthly with liquid manure, zucchini is greedy. Growing period: Approximately 8 weeks. Size: Height up to 45cm, spreads about 1m. Harvesting: Smaller zucchinis are tastiest as older crops are tougher and less flavoursome. Use a sharp knife to cut the zucchini from the plant. Harvest male flowers (those on bare stems without a baby zucchini attached) for salads and stirfrys. Harvest regularly to encourage further cropping. Suitable for: Large containers or vegetable beds. Good companion plants: Tomatoes, parsley, silverbeet, corn, capsicum. Plant with nasturtiums and marigolds to discourage the pests. Common pests: Aphids, caterpillars, slugs, snails. Common diseases: Mildew during hot, humid weather. Storage: Dehydrates quickly. Store in the fridge in a plastic bag. Zucchini doesn’t freeze well as it has a high water content and freezing makes it turn mushy. Tips: You can eat the flowers; stuff them or use them in salads and stirfries. Zucchini can be useful as an attractive border plant. Zucchini plants are abundant, so you will probably only need 3-4 plants.